Grafting is a horticultural process that involves splicing one plant onto another to jump start growth. The root stock is the base, or anchor, of the operation used for its already mature, well developed root system. The scion is the plant matter that is grafted on; if the process is successful, you end up with a genetic duplication of the scion. Edra Sotoâ€™s current exhibition “Graft” is on view now at Terrain in Oak Park, a project space encompassing artist and principal Sabina Ottâ€™s front yard. Soto uses Ottâ€™s front porch as the root stock to graft her installation, comprised of patterned, bright white screened gates, onto, and although they mimic the aesthetic appeal Â of similar gates in her native Puerto Rico, they function quite differently in the terroir of Oak Park.Â Soto was kind enough to discuss this, along with her inspiration for the project and her own gallery and art collection with me below. “Graft’s” closing reception is this Sunday, April 21 from 1-4pm. 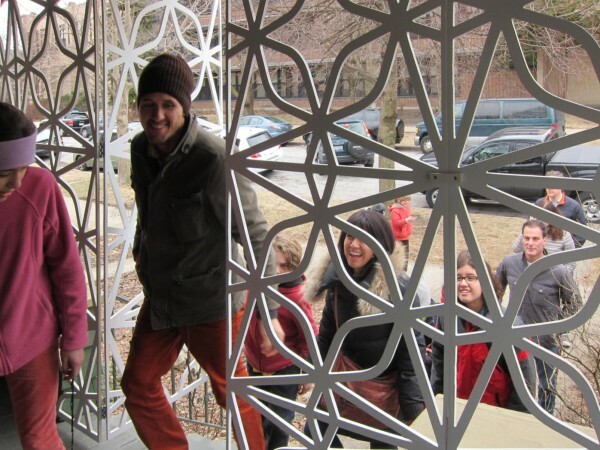 TLN: I know the patterning and the structure of the screen installed at Terrain is inspired by similar wrought iron fences in Puerto Rico, where you’re from. Can you tell me a little bit about your background, and what inspired you to utilize these fences in your work– was it their design? A certain nostalgia for Puerto Rico? The way they fit within Oak Park? 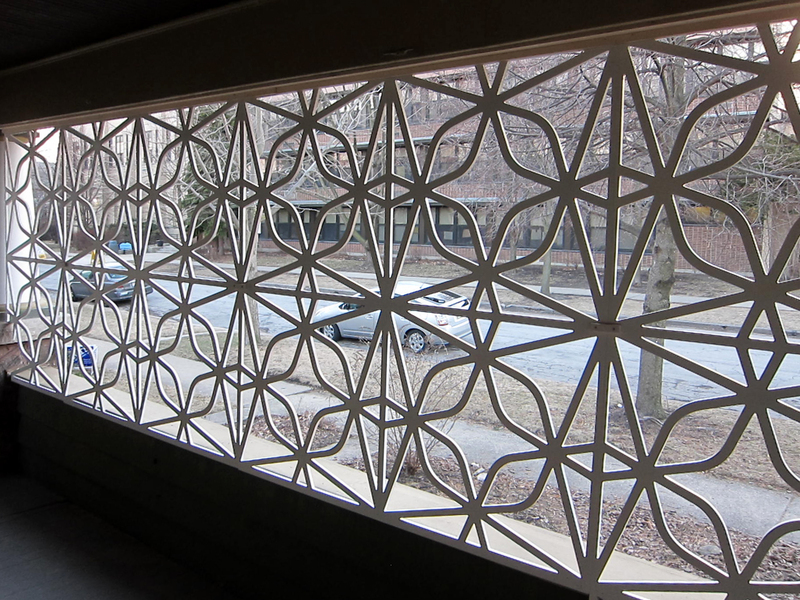 ES: Yes, this patterning comes from iron fences that still exist in Puerto Rico. Many are in my parentâ€™s neighborhood (where I grew up). The neighborhood was built in the early 60s and in addition to the aesthetic appeal, the screens provided security and ventilation. Itâ€™s easy to find all kinds of information relevant to the problems related to criminality at that time. 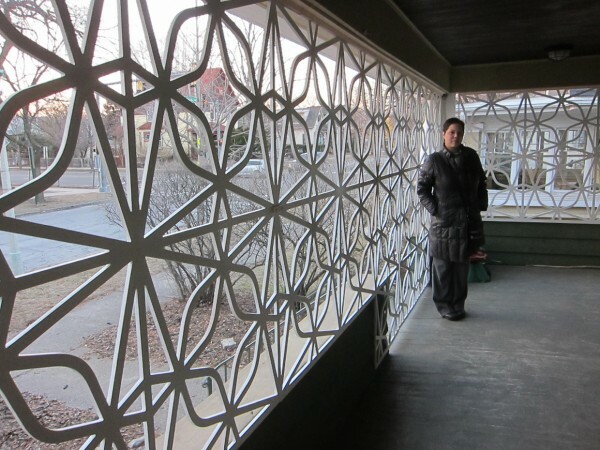 However, thereâ€™s not much information about the pattern designs of the fences. My interest in these patterns started around 7 years ago. I made some illustrations of them, but didnâ€™t develop the idea further. My frequent visits to Puerto Rico awoke my interest in them again. My husband started using some of these patterns in the furniture he builds and that definitely made me feel I was missing out. Somehow, his admiration of the fences validated my previous interest in them. The last time I went to Puerto Rico with my husband, we went on fieldtrips around my parentsâ€™ neighborhood and adjacent neighborhoods to take pictures of these fences. That was one of the most fun things we have done together. We truly love finding patterns we havenâ€™t seen before. 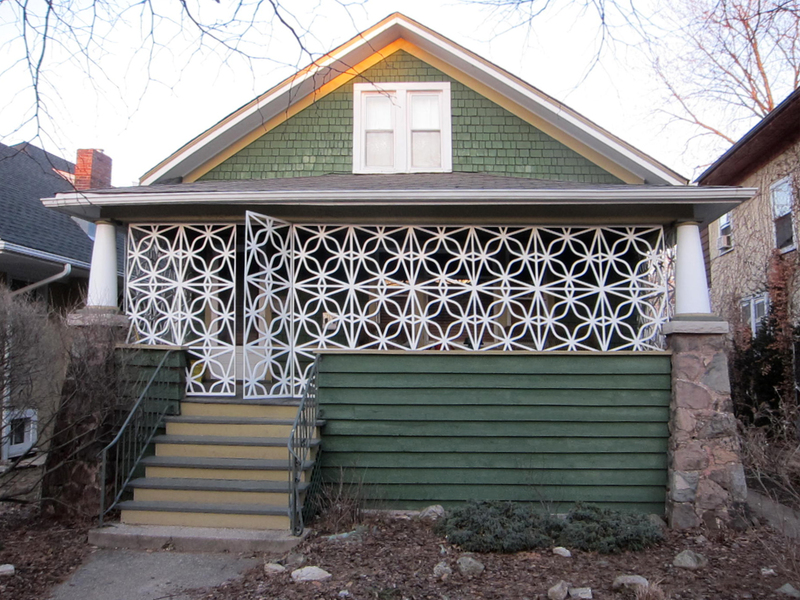 After all that fun activity, the idea of transplanting a Puerto Rican fence in Oak Park came to me. Their beauty allures me but their potential of becoming modern art when taken out of their original context spooks me! TLN: You run a gallery space in your backyard, The Franklin, and Sabina Ott has dedicated her front yard to her exhibition space, Terrain. Do you think The Franklin and Terrain have a lot in common, or do they take two different approaches to a similar format? What are some challenges of having an outdoor exhibition space? Do you find that most of the works are made specifically for the exhibition space? ES: Iâ€™m so glad you ask this question because it hasnâ€™t been asked before. Just now, we have created evidence that documents one small part of the history of domestic artist-run gallery spaces in Chicago. I probably will have a conversation with Sabina soon, since I donâ€™t know the reasons why she chooses to do her projects in her front yard. From my end, I was offered an exhibition at Northeastern Illinois University last year and had almost a year to conceive the project. That time allowed me to partner with my husband on the project, have a lot of conversations about possible projects, and eventually, creating The Franklin became our project. I kept asking myself â€˜what can we offer to the art community that is not available to themâ€™? Having a significant art collection was another motivation, thinking ahead of time that it would be great to open our house during opening nights at The Franklin and extend the life of the artwork we own beyond our own personal enjoyment. The specific structure of the Franklin offers the challenges of interacting somewhat with its design. 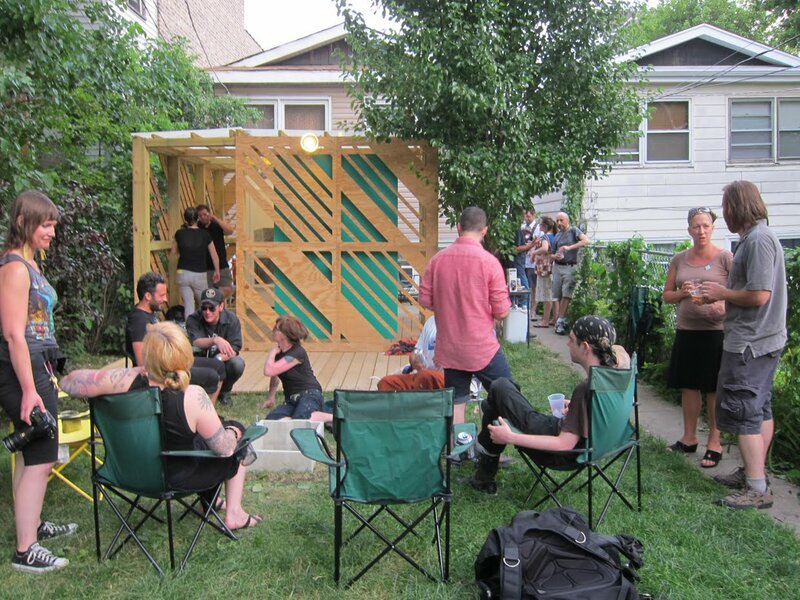 Being partially outdoors forces the artists to react to the space as well. So far, the most successful projects come from artists that have challenged themselves by creating specific interactions utilizing their work, their aesthetics and their ingenuity. It is a great challenge. TLN: Because weâ€™ve worked together previously, I know a little bit about your amazing collection of art work and visual culture in your home, which itself is a kind of museum of objects and works that inspire and influence you. I know you said you would often trade works with other artists, or purchase pieces at auction to build your collection, but what made you want to start exhibiting work and start a gallery? Is it related at all to collecting? Seems like there might be a similarly social aspect of owning and displaying work, but it may also be a more private, archival impulse that motivates you. ES: Collecting art comes from a very honest place. I just happen to love many different kinds of art and also happen to have a lot of talented friends that make it. I am fascinated by materiality and objects, but really avoid being a packrat. Collecting art makes us feel that we are doing something honorable. It is after all someoneâ€™s real connection to art language and represents a little bit of the person that made it. I wouldnâ€™t display my work at my house because I have always thought that it is a little bit tacky. Itâ€™s like putting a big portrait of myself in the middle of the room. Not that I donâ€™t have pictures of me (most of them with my husband) around the house. But I see those as memories reminders. One of the reasons I felt motivated to open a gallery in our backyard was to give a â€˜second lifeâ€™ to our art collection. Having other artists work at your house, in such a private setting, kind of limits the initial purpose of that art piece. Indeed, every single time we have an opening, I encourage people to look around. Lots of work gets lots of compliments and I get to tell the visitors, and then the artists, how much people like their work. So The Franklin has 3 major components: The exhibitions at the space, the art collection, and an upside down pineapple cake that Iâ€™ve been making since 2009. Derived from my wedding cake, made by my mother, I started this project in an effort to transform sour memories around the original cake. Now itâ€™s one of our traditions at The Franklin. 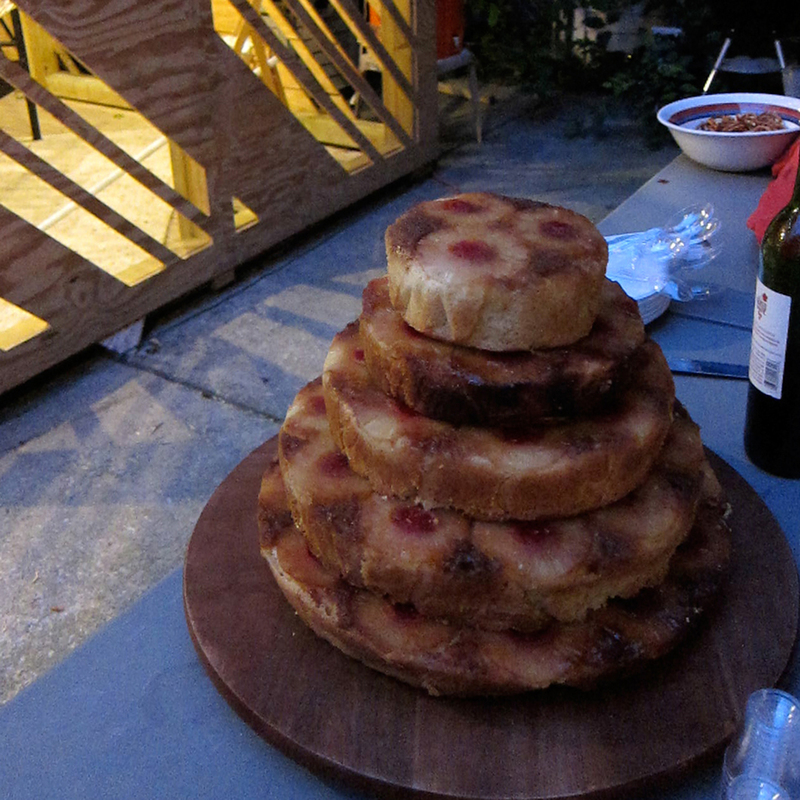 An installation of these cakes will be created for a collaborative project by Alberto Aguilar at the MCA during this summer. Interview conducted via email April 2013.